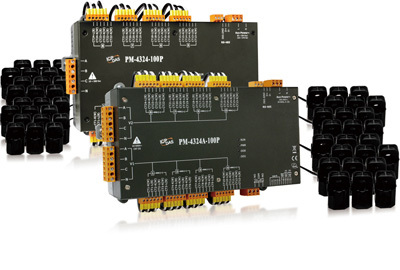 ICP DAS (Taiwan) has introduced the PM-4324-CPS power meter. It provides CANopen connectivity. The multi-circuit power meter monitors up to eight 3-phase circuits or 24 single-phase circuits. Any combination of single- or 3-phase circuits is also possible. This flexibility makes the PM-4324-CPS series suitable for multi-tenant facilities such as residential projects, office buildings, and shopping malls. The currents are measured by means of external current transformers. The instrument is designed to fit into existing panel-boards or be flush-mounted nearby, thus eliminating the need for expensive retrofit projects or for allocating extra space for the device. The provided CANopen interface enables users to gather the real-time power consumption information in a host controller. Using the PDO event time power consumption can be recorded at regular intervals automatically. It makes the communication more efficient when collecting a lot of remote power information. The CANopen NMT slave implementation complies with CiA 301 and CiA 401. The device provides 40 TPDOs and supports all PDO transmission types. It features the TJA1042 transceiver by NXP and runs 125 kbit/s to 1 Mbit/s. Canway (Germany) manufactures the CW-401 meter, which provides a CAN interface.